Our advanced anti-virus technology secured your inbox and ensures that you are protected from downloading malware and viruses. Now view your Twitter, Google+ feeds in your Inbox itself. OpenXchange brings all your social media under one roof. Q. How will purchasing Business Email benefit me? 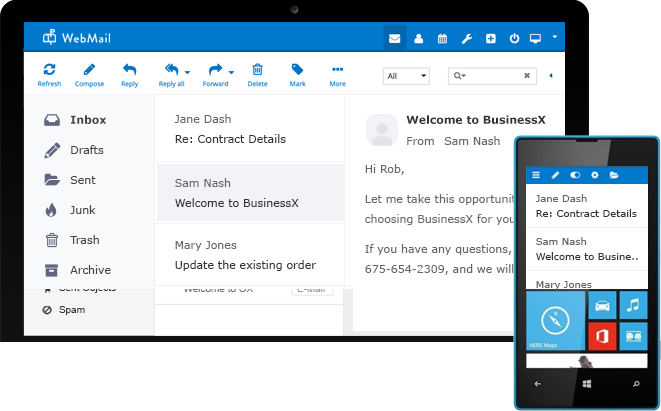 As opposed to free email solutions, you can give your business a more professional image with Business Email by getting email that is branded with your company's domain name (ex. [email protected]). In addition, you also benefit from our advanced email technology that gives you the least latency and industry-best uptime, scalability and reliability. An email service being served out of the cloud also means no IT, hardware, software, bandwidth or people costs. And the best part is that you can add email accounts as and when your team grows. Q. Which Email Clients and protocols are supported? Q. How do I use my Webmail Interface? To access your Webmail Interface, you can use the white-labelled URL: http://webmail.yourdomainname.com. Once on the log in page, you would need to login with your email address and the corresponding password. Q. Which mobile phones can I access my mail from? Q. What is the space provided per Email Account? Each email account comes with 5 GB space dedicated to emails. Q. What ports do I need to use for Email Hosting? Usually, the port used for the Outgoing Mail Server/SMTP Service is 25. However, there might be a situation where your ISP might be blocking the use of port 25 for SMTP service. To circumvent this you can use an alternate port 587 for sending mails. Q. Can I create mailing lists? Yes, you can create mailing lists and add/delete users, select a moderator, restrict people from joining a list or even ban users from a list. More information on this can be found in our knowledgebase. Q. What is your SPAM policy? We take a zero tolerance stance against sending of unsolicited email, bulk emailing, and spam. "Safe lists", purchased lists, and selling of lists will be treated as spam. Any user who sends out spam will have their account terminated with or without notice. Q. Can I use Auto Responders? Yes, you can. An auto-responder is a program that, when setup for your email address, sends out an automatic, pre-set reply to an email, as soon as it is received at this email address. You can find out more about setting up an auto-responder from our knowledge base.